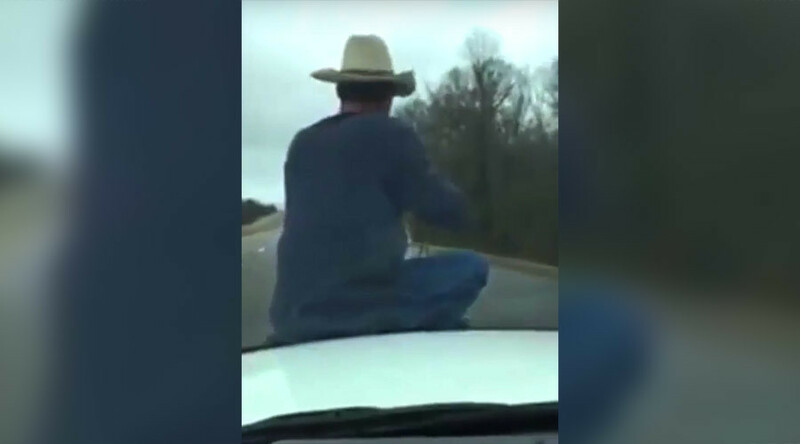 Video of a man expertly lassoing a calf from the hood of a cop car as it races down a highway in Tennessee has racked up more than 2.5 million views online in two days. Local farmer David Bevill just happened upon the scene when the sheriff enlisted him into help. “He hollers at me and asks ‘do you got a rope?’” Bevill said to Channel 5. They quickly came up with the plan that Bevill would ride on the front of the cop car and try to lasso the loose calf. “Hi folks, I’ve got David Bevill on the front of my control car and we got a calf found in the middle of the highway,” Sheriff Belew breathlessly explains in the viral video. “It was probably the best loop I’ve ever thrown in my life! It surprised us both!” Bevill said afterwards. The clip has racked up nearly 3 million views on Facebook but Bevill is taking it all in his stride. “I’m not a Facebooker but my wife has told me it’s gone crazy,” he said.